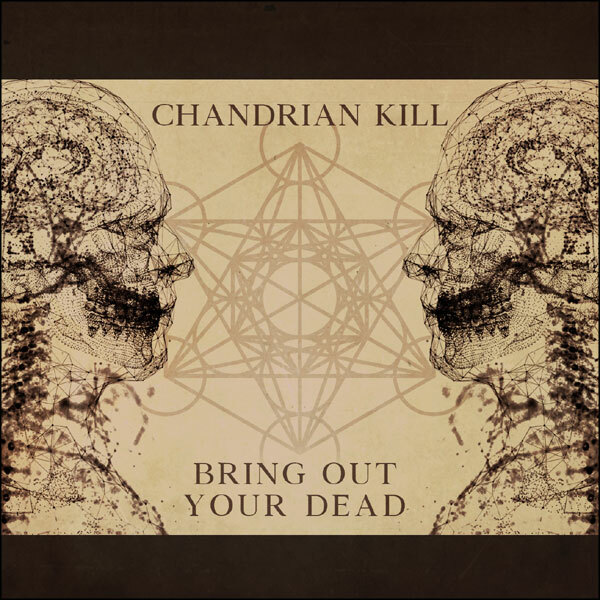 I've had Bring Out Your Dead the debut EP from Chandrian Kill on regular play for the last couple of weeks, finally finding some time to jot down a few thoughts. For those, like me, who are new to the band, Chandrian Kill are made up of Nic Whitmore (ex Number One Son) and Ted Clarke (ex Moesaboa, and My Life in the Making) who have both been around the rock/metal scene a fair bit with those previous projects. It shows, as from the very start of opening track, I Collide, the songwriting and musicianship sounds accomplished. The music kicks in immediately with no introduction needed. The vocals have a confident air, laying down a strong building melody, well suited to the proggy guitar undertones before switching to a harsher metal growl as the riffs and licks develop towards a more industrial feel for the chorus. As an introduction to the band it certainly is a song that grabs the attention. The structure is one of constant change with each section naturally leading to the next. The regular shifts drive the song relentlessly onwards, no rest given, with new twists added each time round until the ending, stopping as abruptly as the beginning. A similar head bobbing tempo remains for second track Filter Off, a song that breathes pure musicality and invention. Guitar lines wrap a polyrythmic groove around another memorable vocal melody for the main hook, while whispered verses float over atmospheric bass driven soundscapes that switch to djenty accented riffs whenever the vocals adopt a throaty roar. By now it is apparent Chandrian Kill have a lot of ideas at their disposal. Thankfully they throw them into the mix without ever seeming to lose song direction and wander off into unneccessary elongated egotistical jams. Remain Alive is the final track on the EP and is more traditional in its songwriting approach. The beautiful airy verses seem to be a Chandrian Kill trademark, and the soaring chorus doesn't disappoint here either, but there are less surprises to this track. The three minute mark trips a harder funkier metal break before the chorus leads the way to the end, finishing on a satisfying power chord. Incidentally, the first song feels like an ideal track to follow next so it's really easy to leave this EP on repeat, playing over and over, such is the way the tracks sit together. If you haven't guessed, I really like this record. Bring Out Your Dead is a beautifully crafted EP. Fans of the prog/metal genres should find a lot to get their teeth into with Chandrian Kill and it feels to me like this is just the start of something great. The EP is available now released by Bar3 Records. Find out more about Chandrian Kill here. In a sharing mood? I always need as much publicity as I can get!